The mobile communication subscriber landscape continues to shift and evolve as more markets reach saturation point across the globe. Most vendors have adjusted their product lines to incorporate low-cost mobile phone models that appeal to consumers in emerging nations, but a few still prefer to rely on the perception that their devices are worth a premium price. However, over time, these vendors must innovate to deliver greater value, and thereby maintain their profit margins. Brand cachet is very subjective -- even the most committed fans have their limits. Ultimately, everything is subject to change, including gadget fandom. According to the latest market study by International Data Corporation (IDC), vendors shipped a total of 337.2 million smartphones worldwide in the second quarter of 2015 (2Q15) -- that's up 11.6 percent from the 302.1 million units in 2Q14. Following an above average first quarter (1Q15), smartphone shipments were still able to remain slightly above the previous quarter, due to growth in many emerging markets. In the worldwide mobile phone market -- inclusive of smartphones -- vendors shipped 464.6 million units, that's down -0.4 percent from the 466.3 million units shipped 2Q14. "The overall growth of the smartphone market was not only driven by the success of premium flagship devices from Samsung, Apple, and others, but more importantly by the abundance of affordable handsets that continue to drive shipments in many key markets," said Anthony Scarsella, research manager at IDC. According to IDC's assessment, although premium handsets sold briskly in developed markets, it was emerging markets, supported by local vendors, driving the momentum that heavily contributed to the second highest quarter of shipments on record. While the Chinese players are clearly making gains this quarter, every quarter sees new brands joining the market. IDC now tracks over 200 different smartphone brands globally, many of them focused on entry level and mid-range models, and most with a regional or even single-country focus. Huawei captured the number 3 position thanks to strong European sales as well as domestic sales that led to a staggering 48.1 percent year-over-year growth. Huawei's mid-range and high-end models continue to prove successful with the flagship P8, Honor Series, and Mate 7 handsets delivering sustainable growth both in the consumer and commercial segment. Xiaomi continues to find success in its home country thanks to both premium and entry-level devices like the Mi Note and Redmi 2 handsets, which helped Xiaomi achieve a 29.7 percent year-over-year increase. With a significant presence in India and Southeast Asia, Xiaomi is now looking to bulk up its IP portfolio to expand its reach even further outside of Asia-Pacific, starting with Brazil. 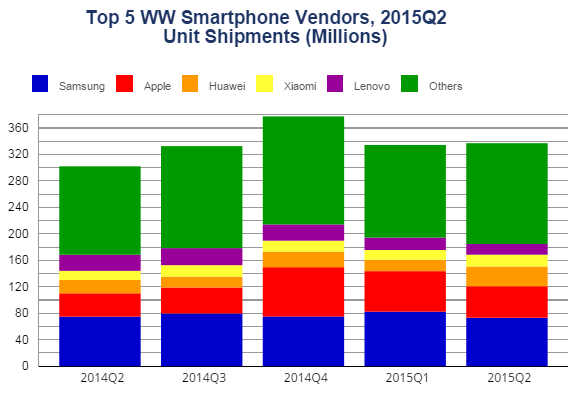 Lenovo, the third and final Chinese OEM on the list, captured the final spot despite steep home turf competition from both Xiaomi and Huawei. Outside of China, Lenovo continued to witness success in many emerging markets such as India with entry-level and mid-range models like the A600 and A7000, sold via Internet retail channels.